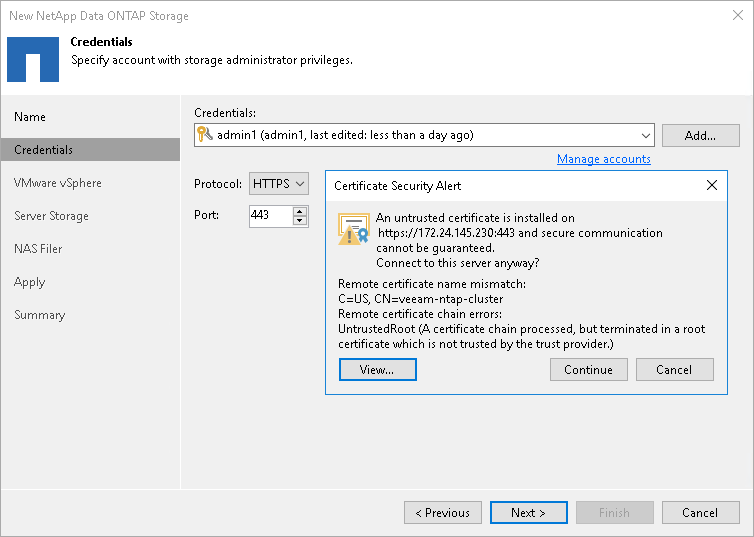 At the Credentials step of the wizard, specify credentials for a user account with administrator privileges on the storage system, and select the transport protocol. From the Protocol list, select the type of protocol over which you want to communicate with the storage system: HTTP or HTTPs. The default transport protocol is HTTPs. However, you can configure the storage system to communicate with Veeam Backup & Replication over the HTTP protocol if needed. 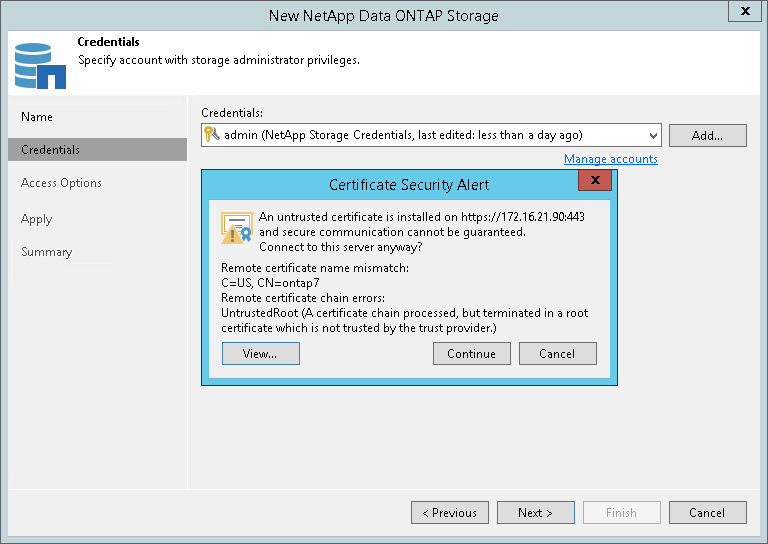 When you add a storage system, Veeam Backup & Replication saves to the configuration database a thumbprint of the TLS certificate installed on the NetApp management server. During every subsequent connection to the server, Veeam Backup & Replication uses the saved thumbprint to verify the server identity and avoid the man-in-the-middle attack. If you do not trust the server, click Cancel. Veeam Backup & Replication will display an error message, and you will not be able to connect to the server. If you update the certificate on the server, you must acknowledge the new certificate in the server connection settings. To do this, in the Storage Infrastructure view right-click the storage system, select Edit storage, pass through the Edit Server wizard and click Trust to acknowledge the new certificate.